Denver is a city intent on beautifying its public spaces — in a big way. More than 60 sculptures, murals and statues can be found on its streets, with more added every year. Many of these public artworks are several stories tall, creating a larger-than-life public art gallery for visitors to discover. 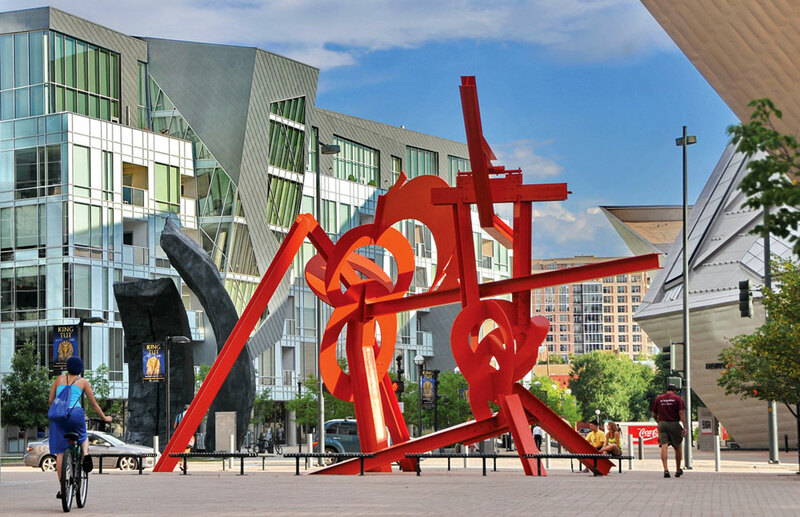 Below are a few of the more colossal pieces of public art to be found around downtown Denver, which you can explore via walking tour. 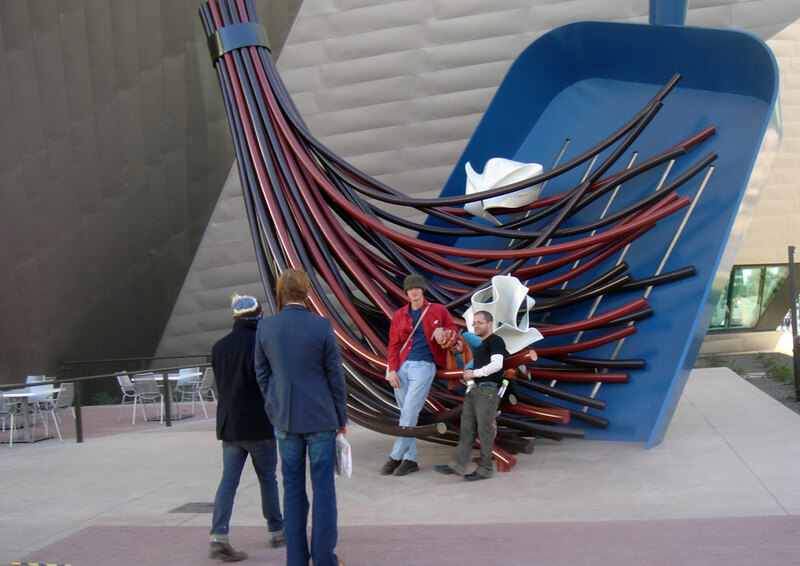 For information on walking tours and installations not mentioned here, visit Denver’s Public Art Program. For a map of the sculptures mentioned below, click here. 14th St. and California St. 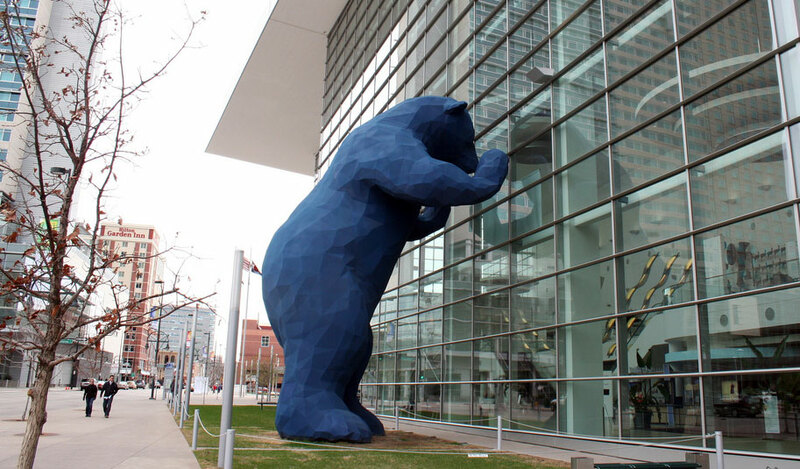 The curious, 40-foot-tall blue bear peeking through the window of the convention center is an oft-photographed installation that seems to have found its way into the hearts of many Denverites and visitors. Speer Blvd. and Arapahoe St.
Two giant white figures prance toward the performing arts complex, perhaps on their way to see a show! Ellie Caulkins Opera House, 14th St. and Curtis St. The undulating wisps of glass are unmistakably the creation of famed master artist Dale Chihuly, who manages to make the massive arrangement seem delicate and airy. DPAC Galleria, 13th Ave. and Curtis St.
A plump and impossibly proportioned bronze couple stand sentry near the Temple Buell Theatre. A jumbo-sized broom sweeps enormous scraps of paper into a waiting dustpan. 12th Ave. and Bannock St.
Mama and baby cows rest in the grass behind the museum, looking a bit like they’ve lost their way from the country. The angular reddish-orange steel sculpture is the perfect architectural complement to the surrounding library and museum. An average-size pony sits atop a not-so-average 21-foot-high red chair, inviting passersby to theorize about how he got there. Civic Center Park, bounded by Broadway, Bannock, Colfax and W. 14th Ave.
An American Indian warrior and a bronc-riding cowboy serve as reminders of Denver’s Wild West roots. A swirling medley of traffic cones, handsaws, hammers and mop buckets is the perfect example of everyday items becoming objets d’art. A 20-by-25-foot recreation of a plumb bob (an architect’s tool) hangs over granite-etched blueprints for the area surrounding the building. Read Inside Denver's First Fridays Art Nights, where more larger-than-life art awaits. Photos: Copyright flickr/Rob! (The Big Sweep); flickr/firepile (I See What You Mean); Visit Denver, The Convention & Visitors Bureau/Steve Crecelius (Lao Tzu).